OLD PARKED CARS. 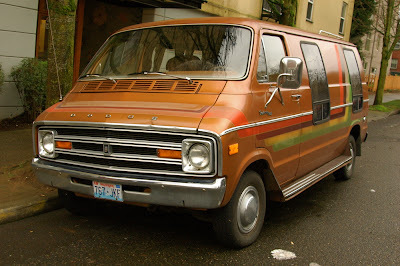 : Saturday Bonus: Previously Deleted Van #1: 1978 Dodge Tradesman 200. Saturday Bonus: Previously Deleted Van #1: 1978 Dodge Tradesman 200. 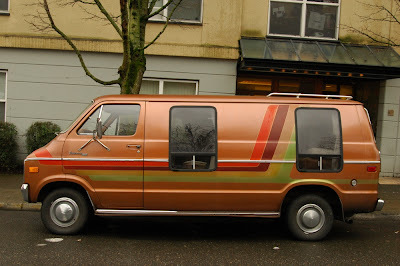 If you were paying very close attention, you might've caught this van briefly posted about a month ago. Ben pointed out its similarity to another recent post, so I pulled it down and replaced it with something else, for variety's sake. Same thing happened with the Silhouette posted below. I absolutely love this thing. The graphics fit with the paintjob. I'm not a Dodge van expert, but I could swear that this van has a 70s front clip with 80s tail lights. It's probably an 80s van that was in an accident in the early 90s and they got a cheap parts van. I believe the front clip would just bolt on and have the same body lines. The tail lights would not be so easy to swap, as the metal body at the back had different openings for the tail lights. The 70s lights were short, wide and almost wrap-around like. 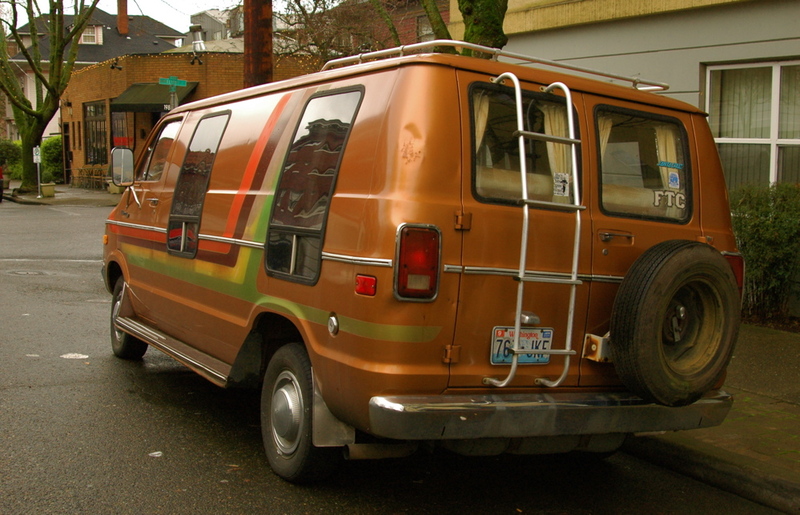 The 80s vans had bigger, upright vertical rectangular tail lights that were beveled out a bit. The taillights are original, 1978 was the first year for them. First year for the updated dash as well.